Milne-Edwards and Haime, 1852, Plate XXXIX. 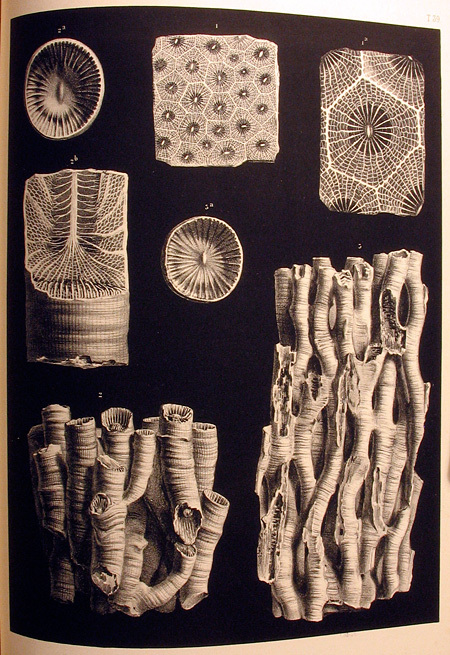 Rugose corals from the Mountain Limestone (Carboniferous) include Lithostrotion aranea (1, 1a), Lithostrotion affine (2, 2a, 2b), and Lithostrotion phillipsi (3, 3a). Leafing through some of the old books lying around here, I have been contemplating the wonders of the illustrator’s art, and how it can translate across the centuries. 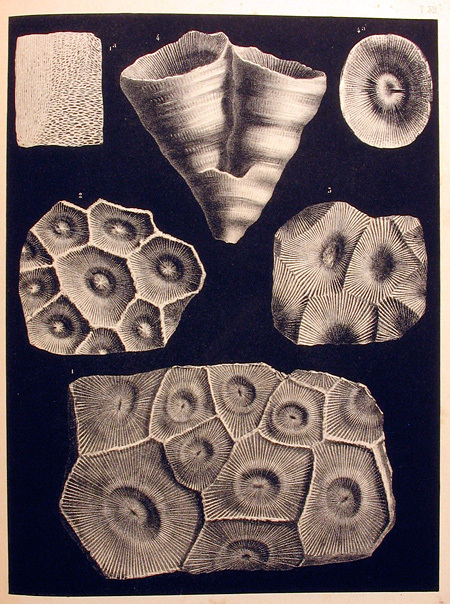 There is little question that artistic paleontological illustration reaching its apogee in the mid 19th century, prior to the widespread application of photography as a means of depicting fossils. In Europe in particular there were many first-rate illustrators, and the lithography was often of remarkable quality. This seems to have begun about the 1820s, and continued as late as the first decades of the 20th century in some countries (such as Sweden) but not in others (the United States, as far as I can tell). Milne-Edwards and Haime, 1852, Plate XXXII. The rugose coral Cyathophyllum regium from the Mountain Limestone (Carboniferous). The plates are beautiful in the facsimile, but in the original they possess remarkable depth, tone, and crispness. The wonderfully shaded images seem to have an inner glow, the corals floating as if suspended above their deep black background. I apologize that my photographs here do them as little justice as the versions in the printed facsimile editions! Milne-Edwards and Haime, 1852, Plate XXXI. The rugose coral Cyathophyllum stutchburyi from the Mountain Limestone (Carboniferous). Not only was the 19th century illustration work remarkable, but the lithography was superb and societies such as the Palaeontographical Society apparently spared no expense on printing, resulting in work superior to anything seen in modern scientific publications. Similarly, some 19th century specimen photography was comparable to or better than the best work we see published today; more on this in part 2, perhaps? * H. Milne-Edwards and J. Haime, 1852. 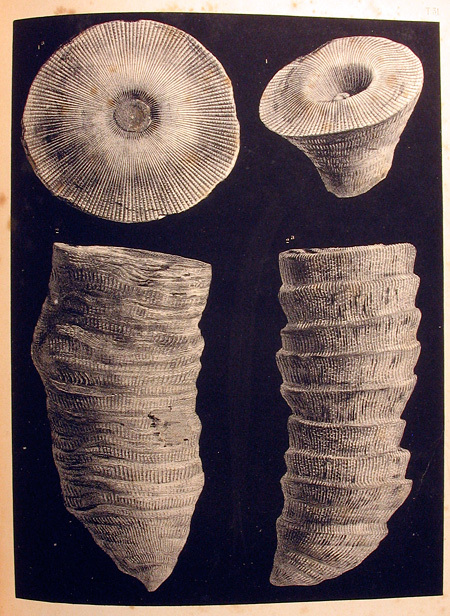 British fossil corals, part 3, corals from the Permian Formation and the Mountain Limestone. Palaeontographical Society Monographs, Volume 6, p. 147-210, pls. 31-46. I agree — very beautiful and also so “realistic”, the 3-D-ness is striking. I look forward to part 2. Thanks for submitting to Accretionary Wedge 43. Incredible dimension and details, beautiful! How wonderful to have an original copy. Thank you Karen. I am fortunate that I have been given quite a stack of 19th century books over the years. I plan to share some of the others in future. Lucky you! I look forward to more. Wonderful! They look like photographs…. extremely talented individuals. Thanks Graham for sharing these images.